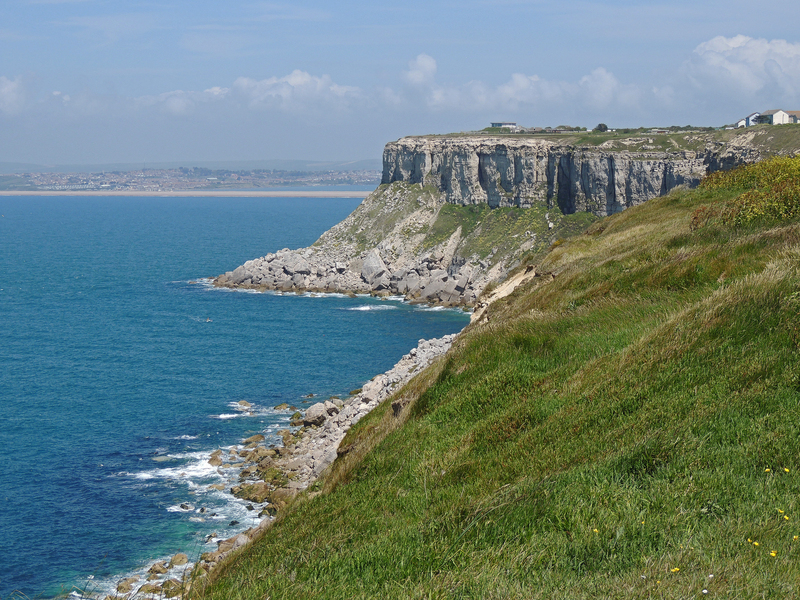 Sandsfoot castle was built in Wyke Regis on the north side of Portland Harbour by order of Henry VIII, fearful of attacks by Spanish and French forces. 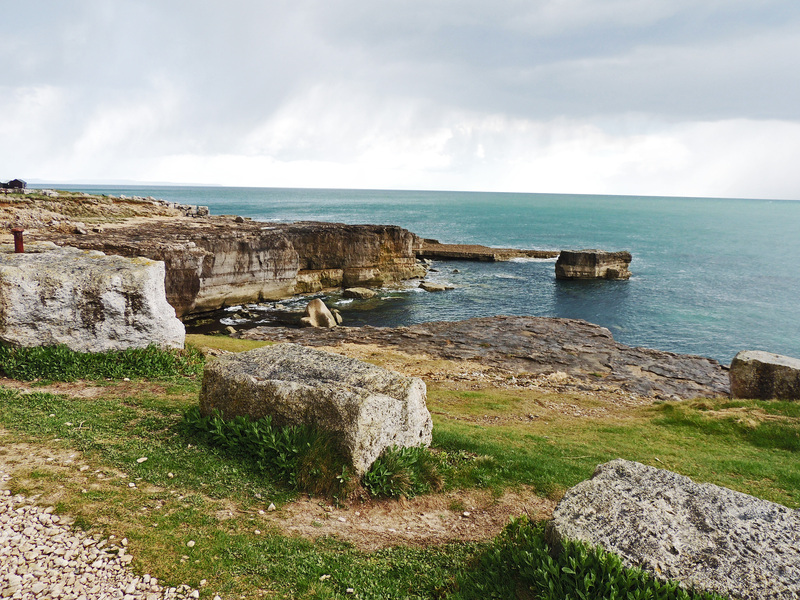 It was built at the same time as Portland Castle on the southern point of the bay and was completed in 1539. 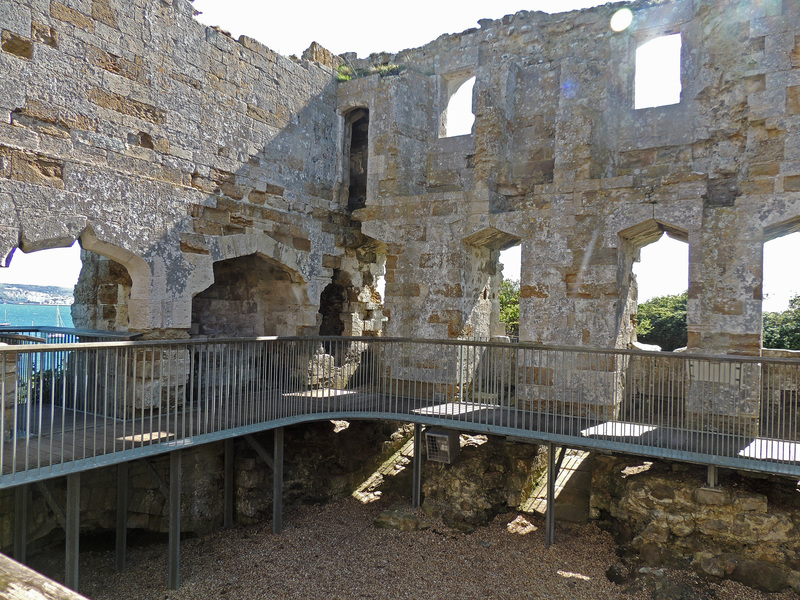 It is said that much of the stone for the castle came from the dissolved abbey at Blandon near Wool. During the English civil war it was held by the Royalists until 1644, when following a siege it was captured by the Parliamentarians, who used it as a storehouse. 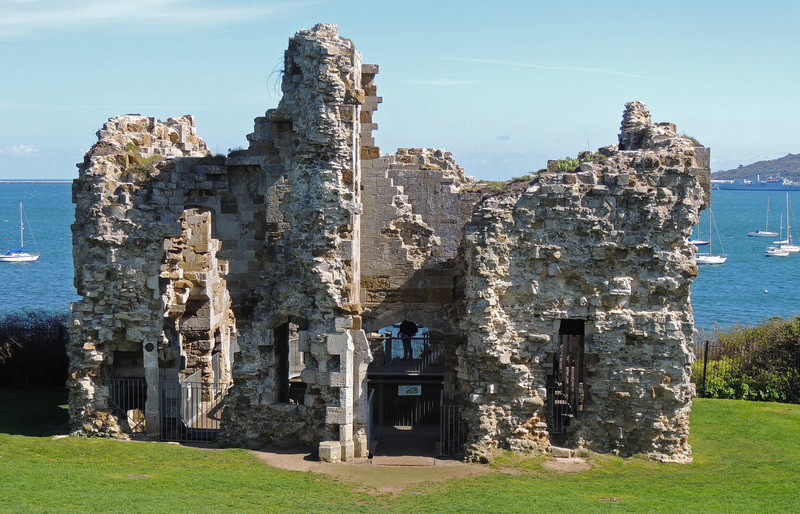 It continued in this role until around 1691, when coastal erosion was threatening to undermine the cliff on which the castle stands. 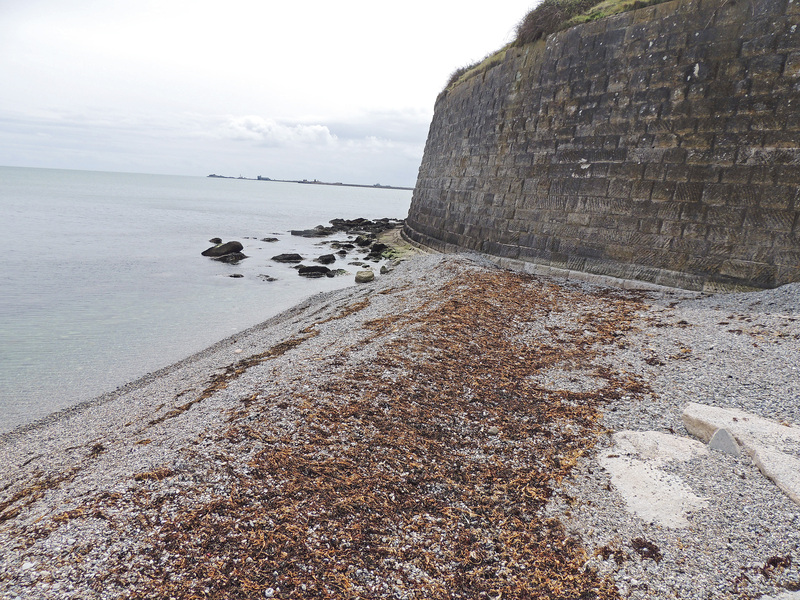 This was addressed by the building of the Portland breakwater in 1849, but by this time the castle was in a dangerous state and had been abandoned. 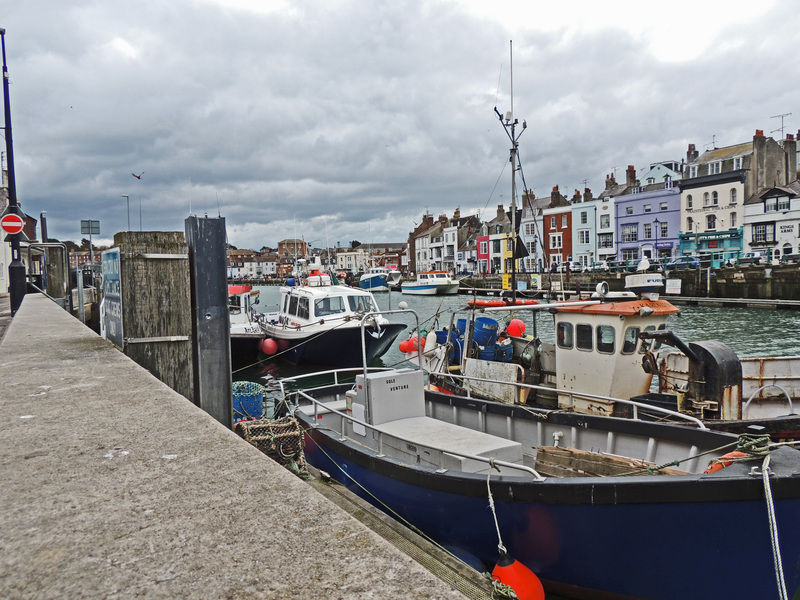 It was purchased by Weymouth Council in 1902 for the sum of £150 and Tudor gardens were laid out on the adjoining land and a public park created. 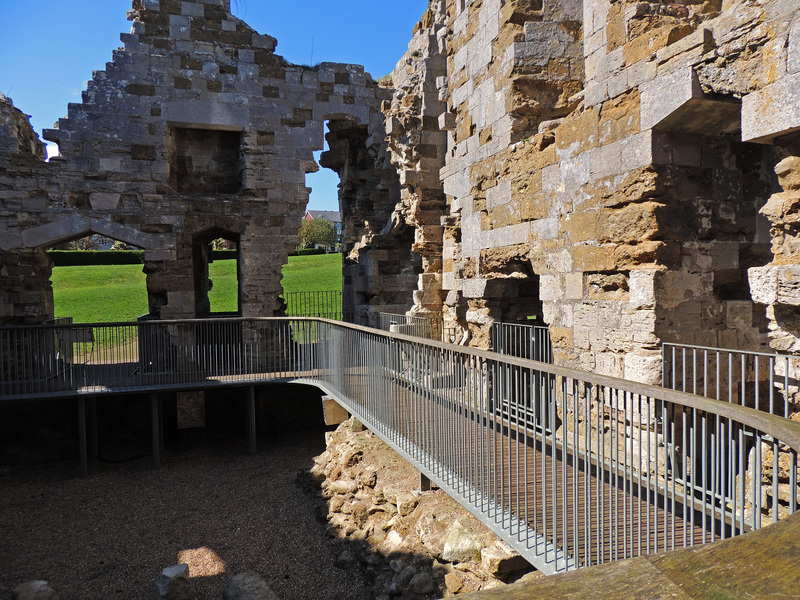 It was not until 2009-2010 that in a joint project with a local community trust that funds became available to carry out the works needed to allow public access to the castle buildings. 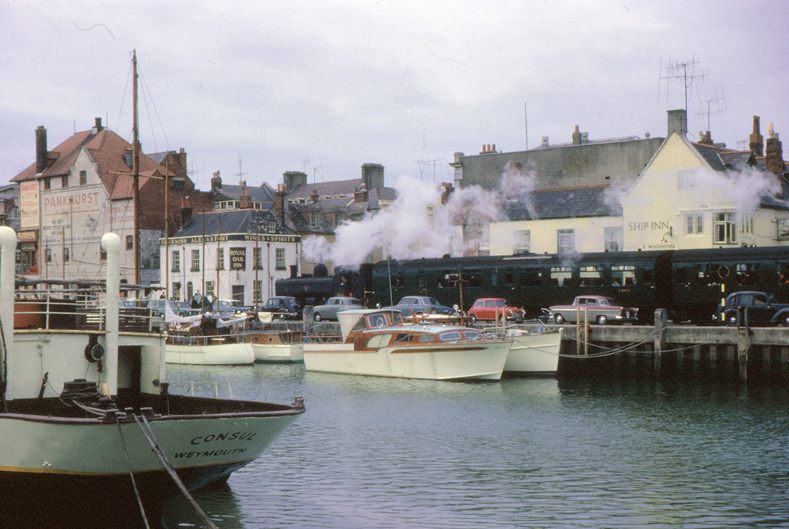 The port prospered and in the 1880s the railway line was extended to carry trains right along the quay to the waiting cargo vessels. 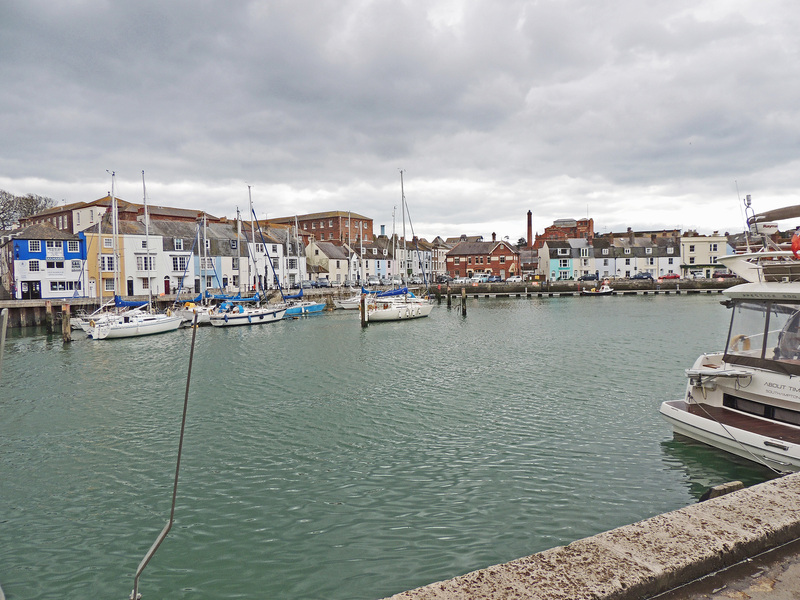 Much of this trade was with the Channel Islands and in the last century the harbourside was busy with imported tomatoes, flowers and vegetables. 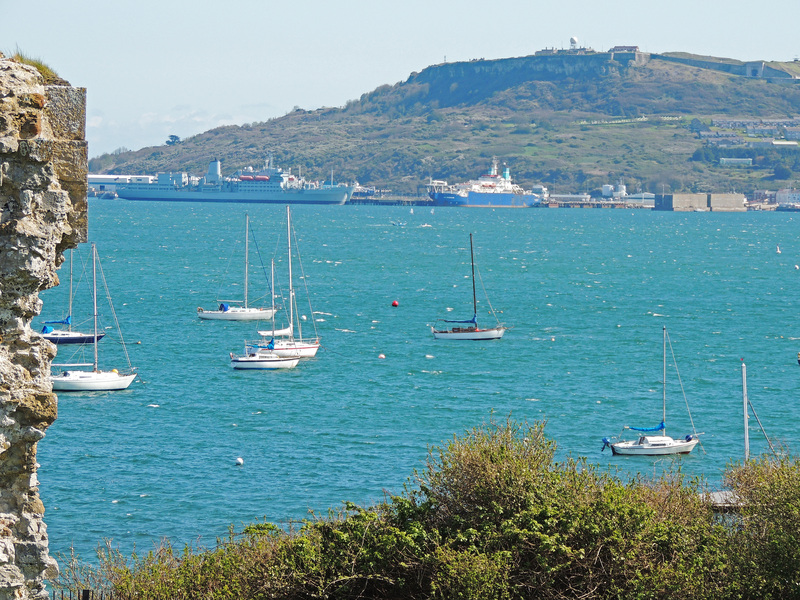 The line also carried passenger traffic which delivered passengers for the channel islands ferry directly to the ship berth. The Goods service ceased in the 1970s and the last passenger service was in 1987, although it was used up till 1999 for special charters. 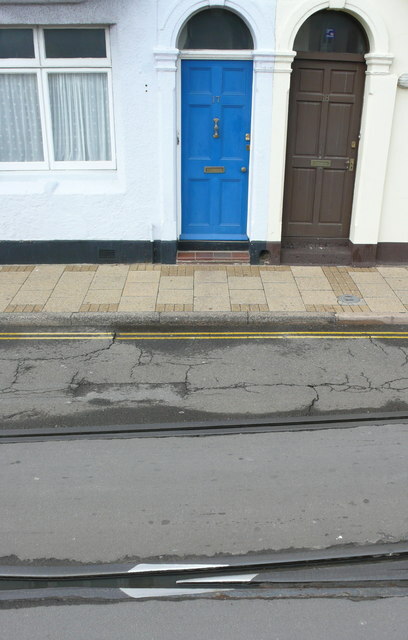 The lines can still be seen running through the streets of the town to the docks. Train tracks in Weymouth Street (This file is licensed under the Creative Commons Attribution-Share Alike 2.0 Generic license. In 1921 a dam across the river was built to ensure the water level in the harbour – this replaced an earlier dam which was finally removed in 1995 when the harbour was dredged to improve access. 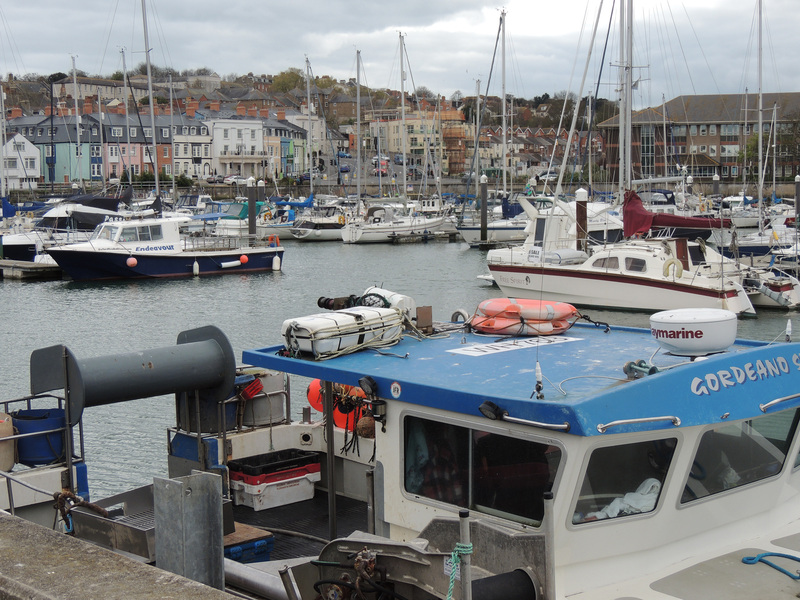 The Harbour today is a mixture of small pleasure craft; working fishing boats; luxury cruisers and tourist boats. 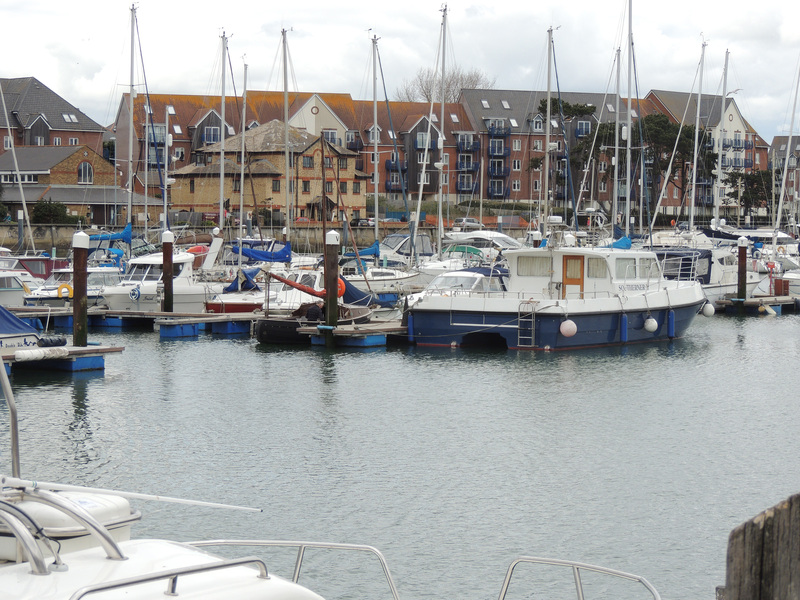 Until last year it remained a port for the Channel Islands ferry service, but this has now relocated to Poole Harbour. 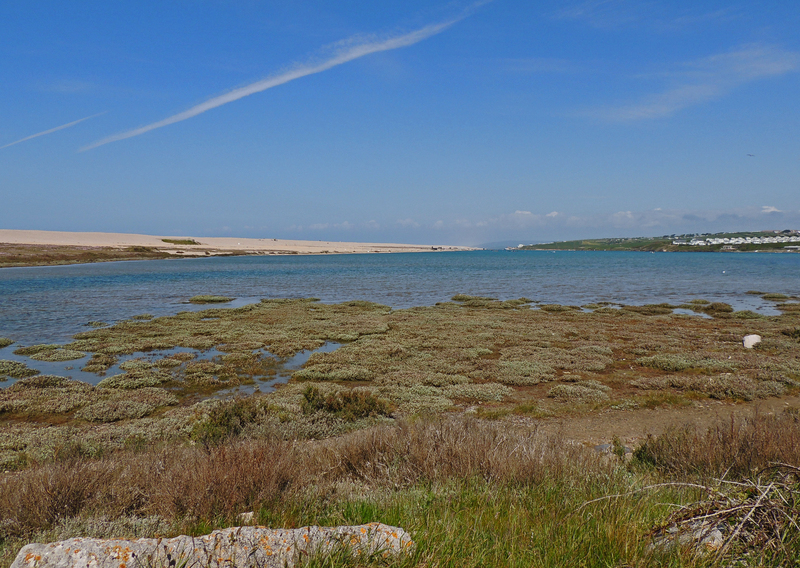 Our final day in Dorset and the heavy rain forecast has not materialised and so we set off for the RSPB reserve at Lodmoor on the eastern edge of Weymouth to see if we can add a few new species. 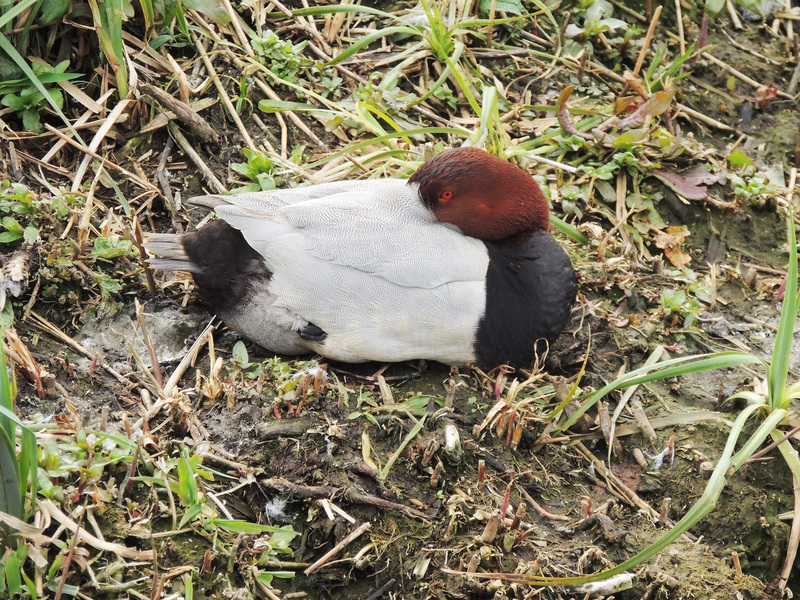 Unfortunately it seems very quiet, possibly due to the strong north winds which have been blowing down the Lothan Valley for most of the week. 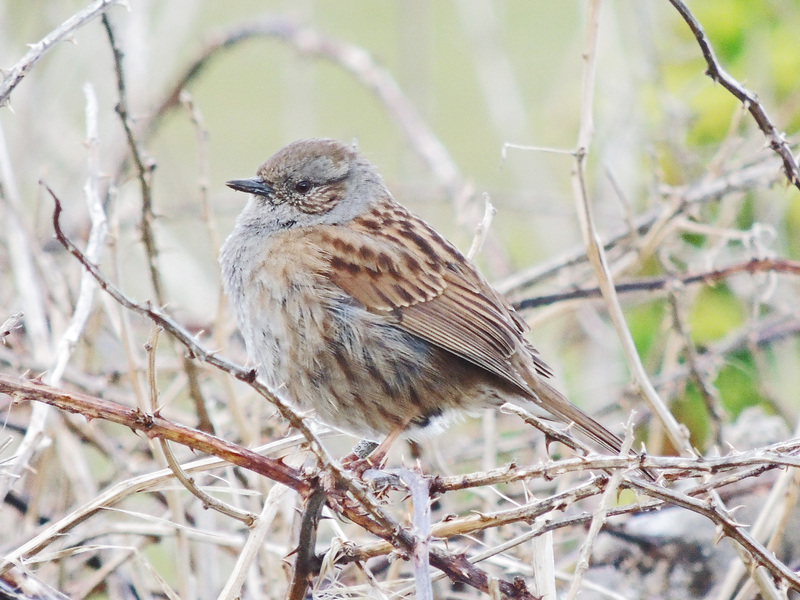 We do locate a single drake Northern Shoveller , but otherwise there is little else to see until we are just about to leave the reserve when a Lesser Whitethroat called from deep within a bush, Despite our best efforts this bird remained unseen as this skulking species often does. 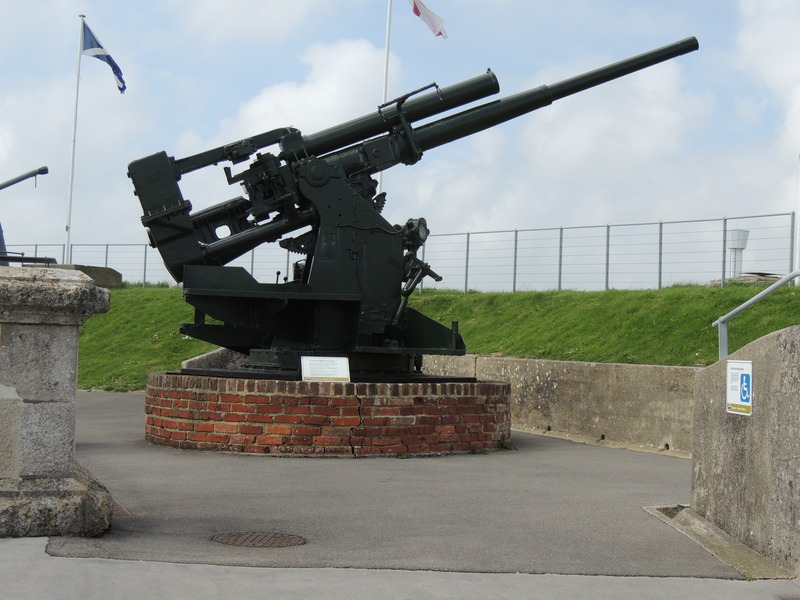 Our final stop is Nothe Fort, built to defend Weymouth Harbour. 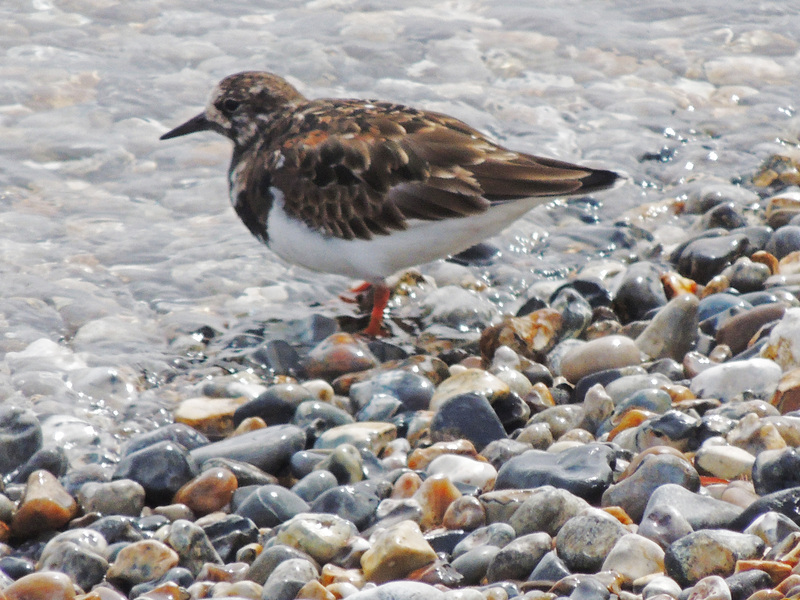 The rocks and small beach below the castle are a good site for Ruddy Turnstone and sure enough 6 birds are busy feeding together with a Rock Pipit. Then it is time to collect our bags and head for the station to return to London. 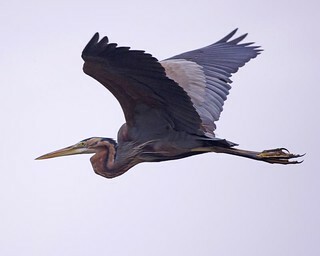 A good trip – 106 species between us which is similar to our trip here in May last year. 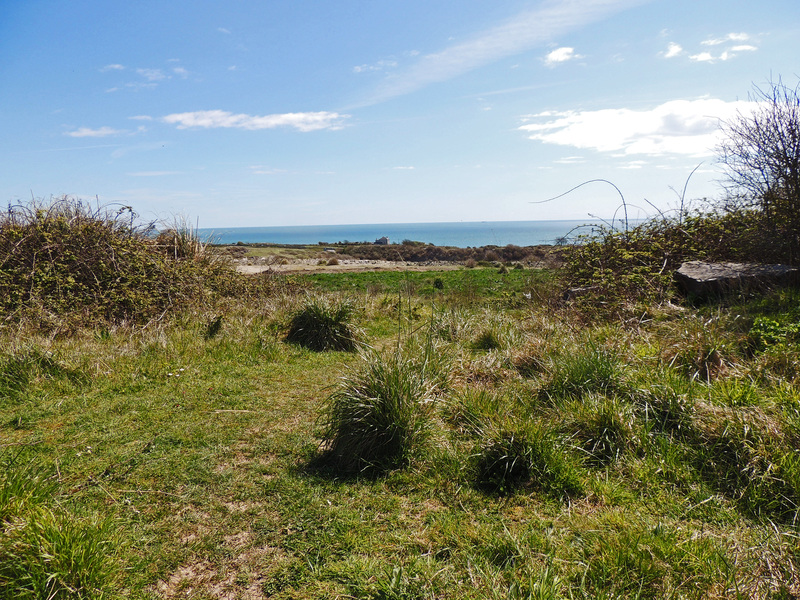 Having visited the southern end of Portland on Tuesday, we decided to explore the northern end of the isthmus for migrants this morning. 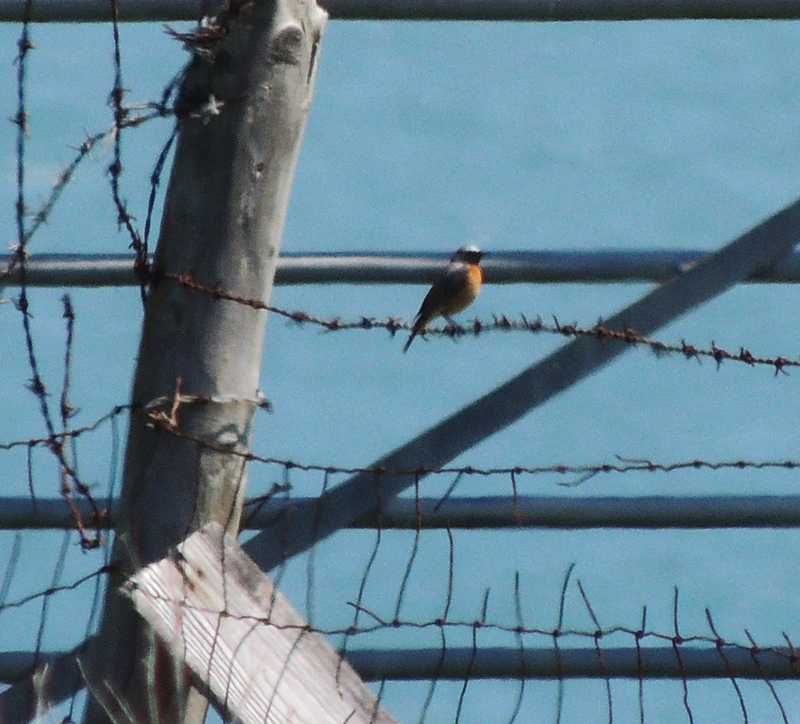 Willow Warbler, Common Chiffchaff and 2 Spotted Flycatchers were present coupled with some spectacular views back across Portland harbour. 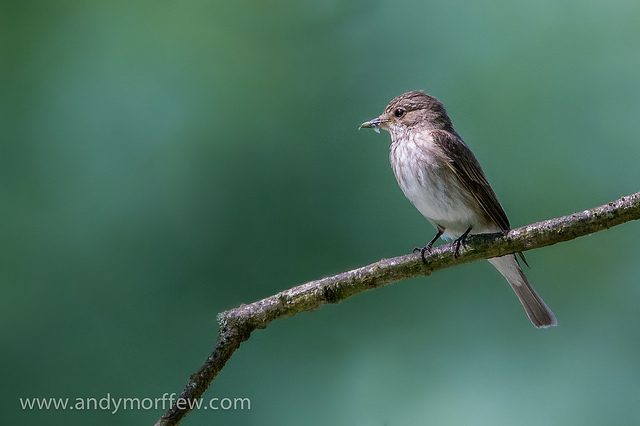 Our next stop was in Southwell where Pied Flycatcher had been seen earlier in the morning. 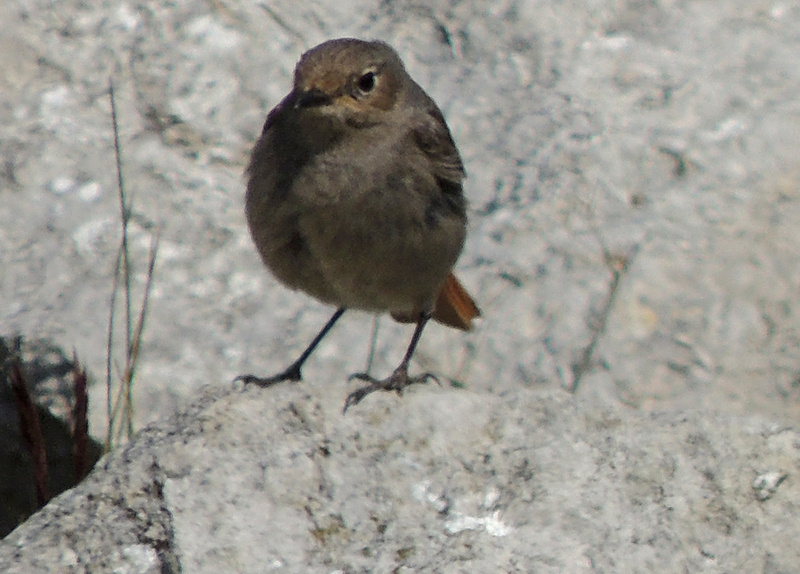 Again there was plenty of migrant activity with Willow Warbler, Blackcap and Spotted Flycatcher present. 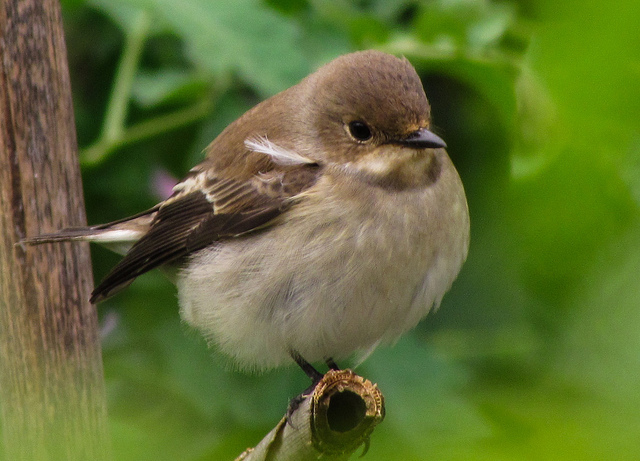 After a 30 minute search we decided to move on and as we walked back to the bus stop, I saw a bird ‘flycatching’ from a tree and a closer look identified it as a female Pied Flycatcher. 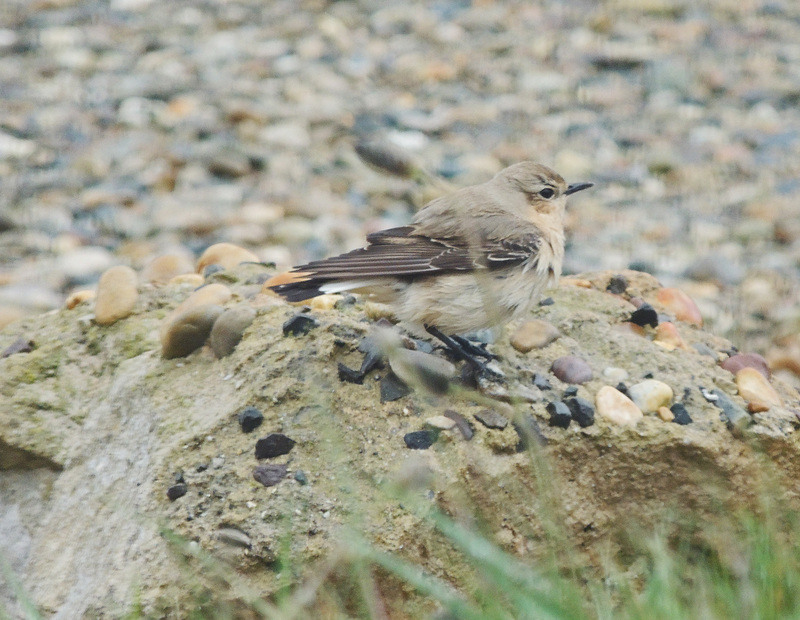 Our next stop was Chesil where we again found a Northern Wheatear, Ringed Plover and Dunlin. 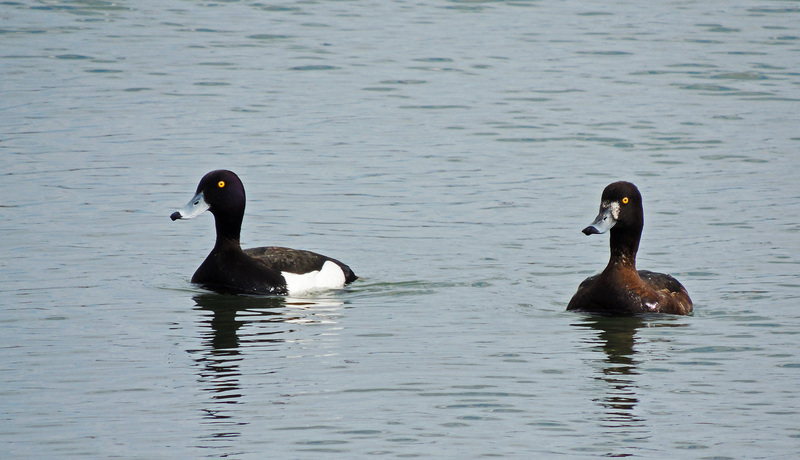 Our final site of the day was back at Radipole Lake where we located the long-staying Hooded Merganser and amongst the birds feeding over the lake – Common Swift, Sand Martin and House Martin. 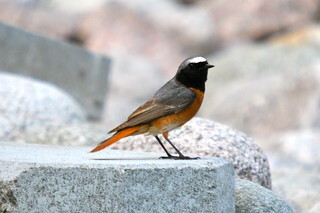 As we made our way along a path north of the information centre we heard the ‘ping’ call of Bearded Reedling, although unfortunately the birds never showed themselves. 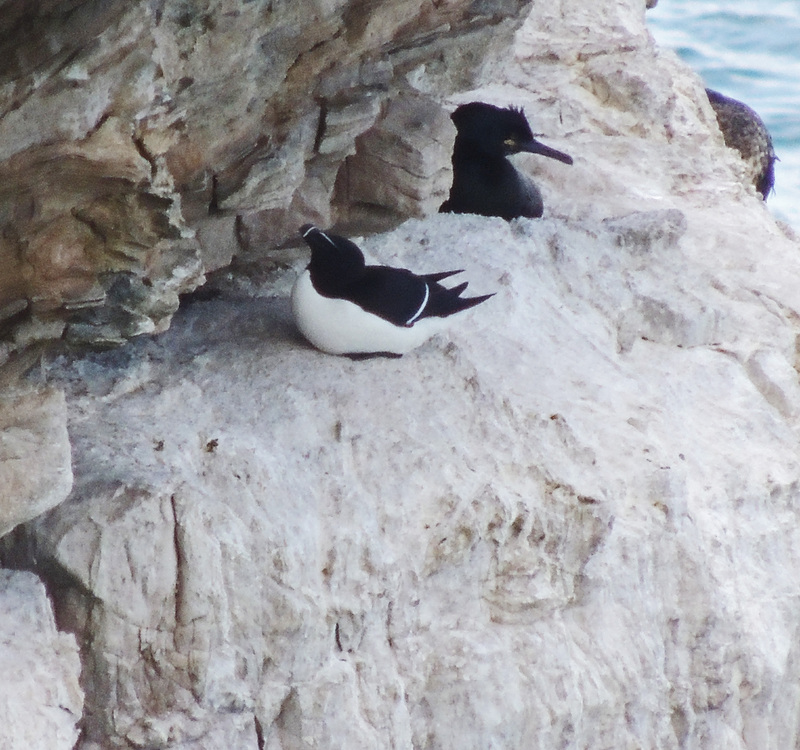 A day in the Purbeck area of Dorset with local birder, Neil Gartmore as our guide. 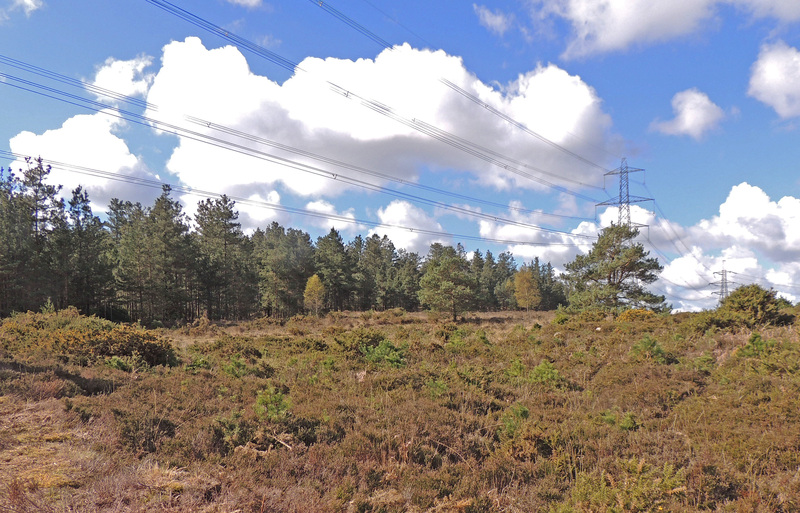 Our first stop was Morden Bog, an area of Dorset heathland. 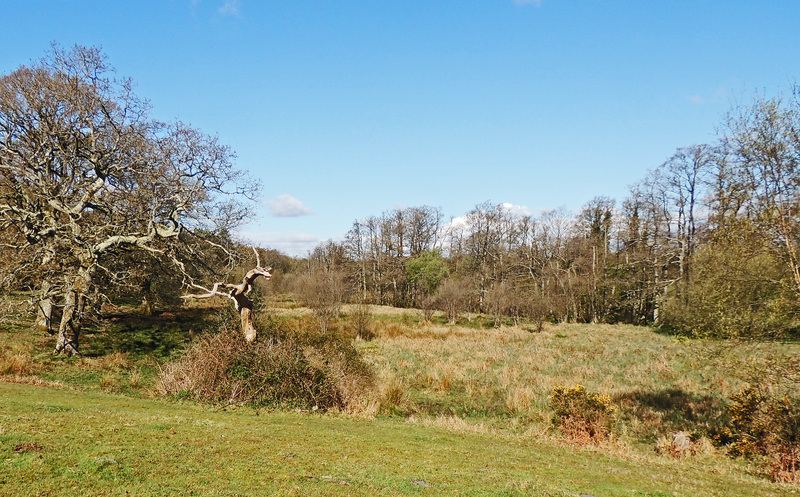 Our first stop was at a small woodland where we searched for the rare and elusive Lesser Spotted Woodpecker, alas without success, but a number of other woodland species including Greater Spotted and Green Woodpecker were recorded. 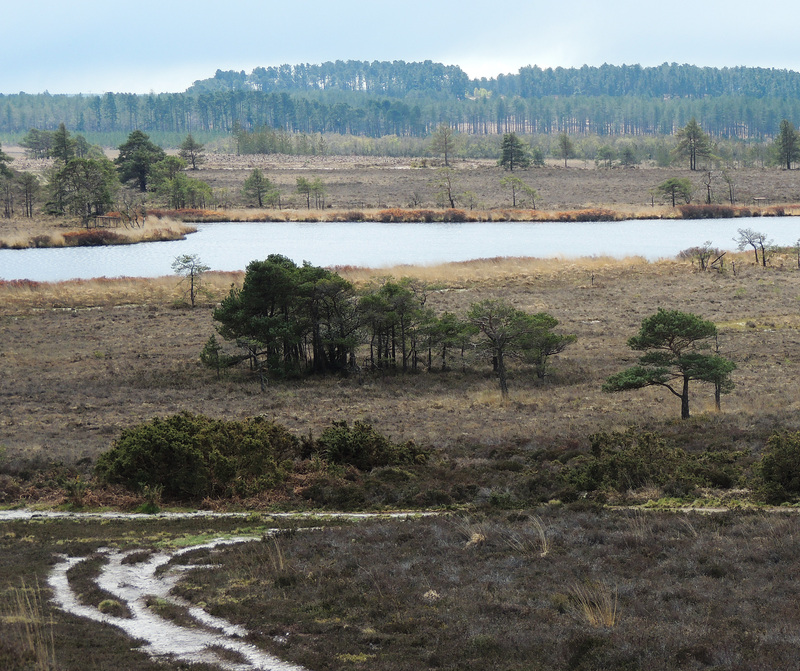 As we walked the heathland paths, we added Dartford Warbler, Woodlark, Redstart, Common Crossbill Siskin and Redpoll although none showed well enough and/or long enough to allow photography. 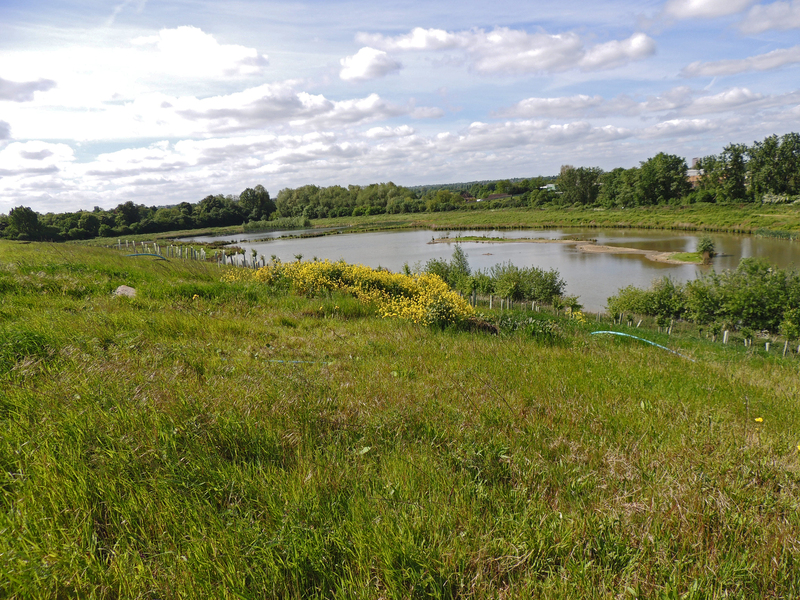 Our second stop was Swineham Gravel pit where we saw an obliging Bar-tailed Godwit and 2 Common Sandpipers alongside the common waterbirds. 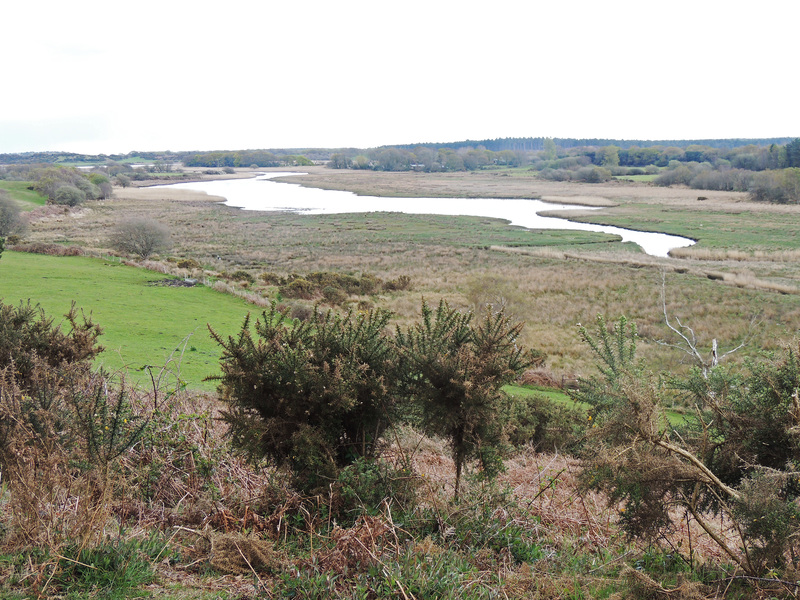 We then visited Middlebere on one of the inlets of Poole Harbour. 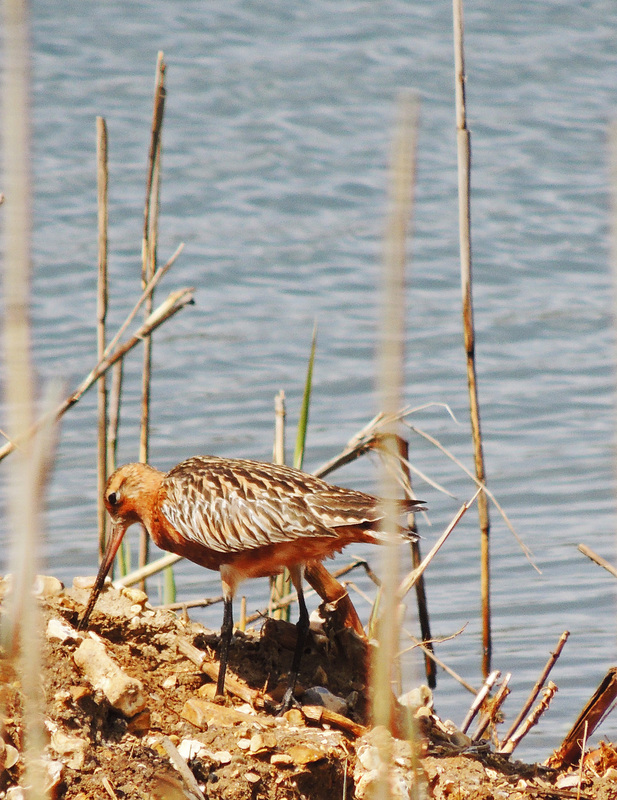 In front of the hide we were able o compare Common Redshank with its relative Spotted Redshank. The weather started to close in and so a final visit to a moor where Hen Harrier has been seen recently had to be abandoned due to the rain. 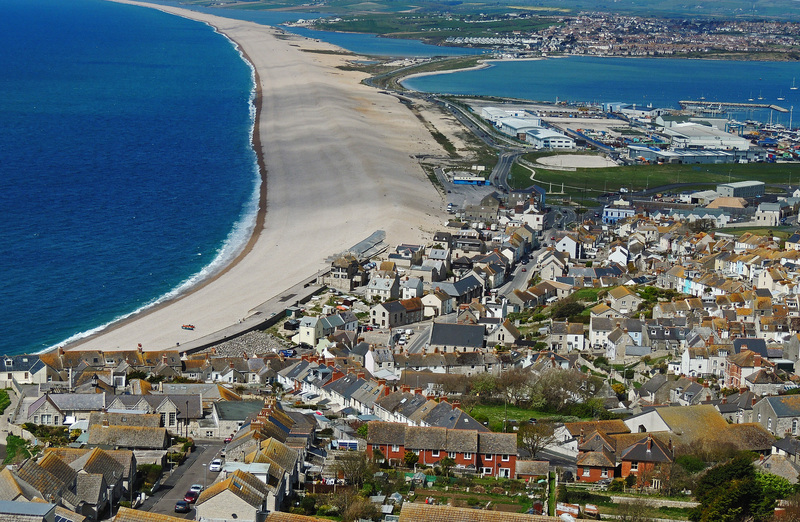 Day 2 of our trip to Dorset and we set off for a visit to Portland, famed for its building stone. 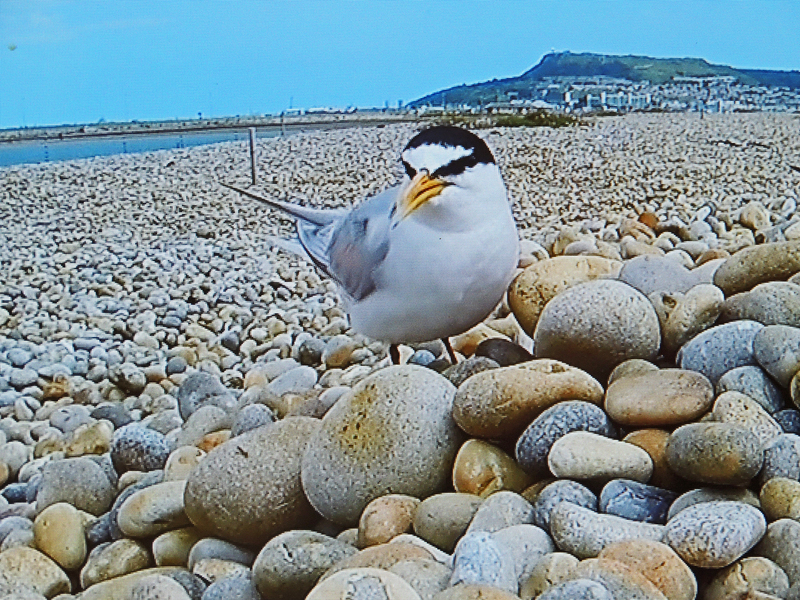 Portland is a long isthmus of land which projects south from the coast into the English Channel and which is often the first landfall for migrating birds. We can hear that many Common Chiffchaffs have arrived overnight together with a few Blackcaps and Common Whitethroats. 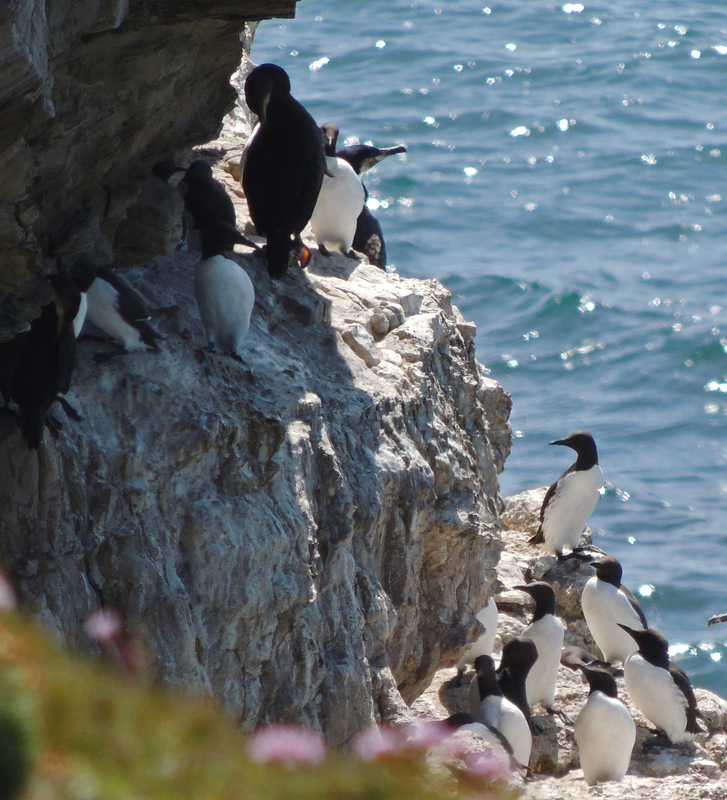 Reaching the southern end of the isthmus, known as the bill, we are able to view the nesting colonies of birds on the cliff face – Guillimots. 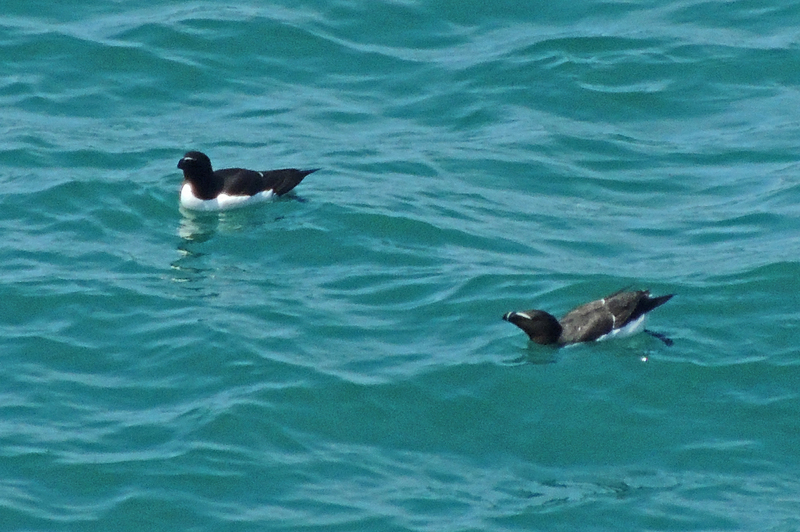 Razorbills and European Shag along with Fulmar and Raven. 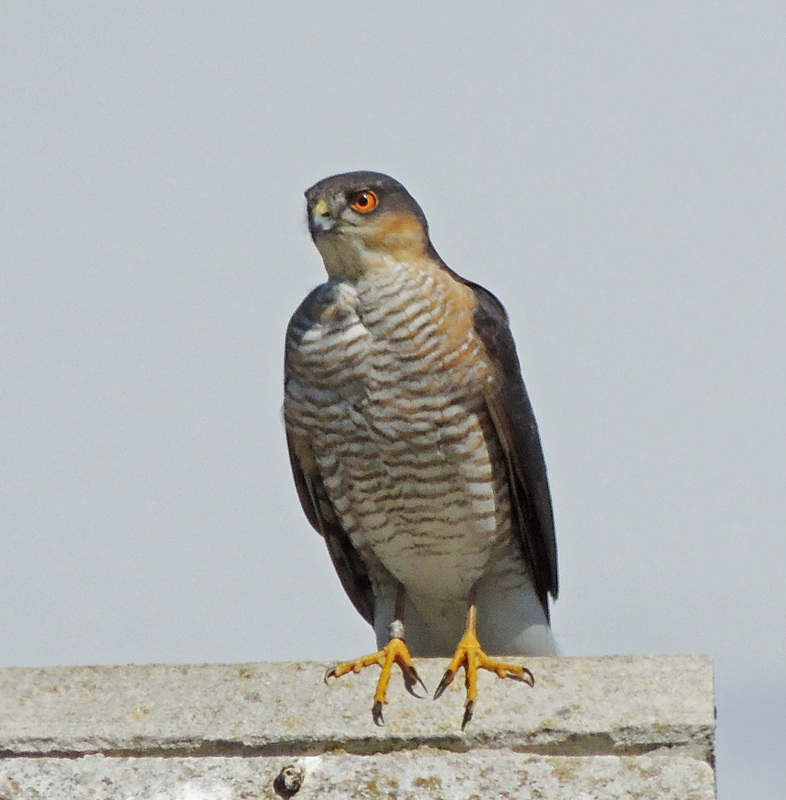 After lunch we return north along the coastal path and had wonderful views of a Sparrowhawk. As we arrive at the narrow spit of land which connects Portland to the mainland, the weather begins to turn. Making our way through the rain we come to the Chesil reserve centre and a welcome stop at the excellent coffee shop. 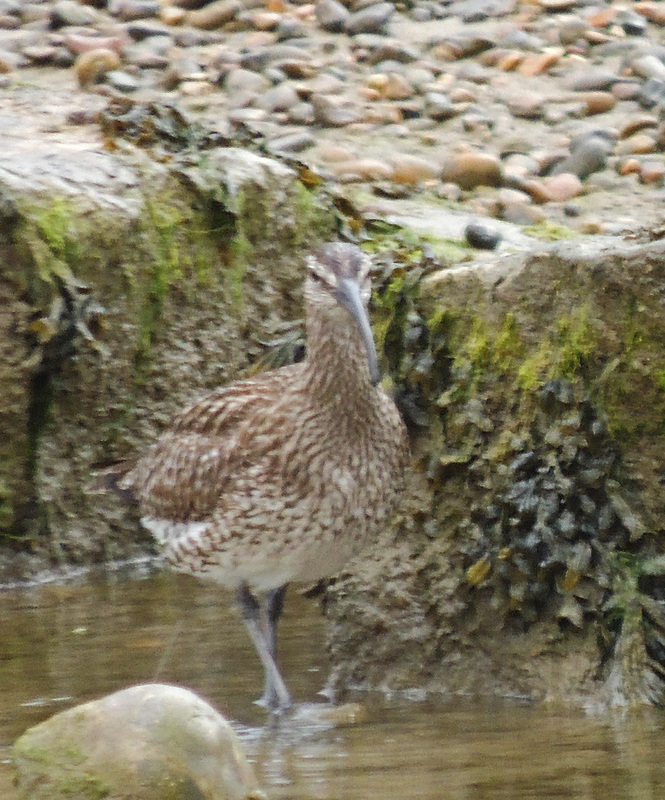 As we sat drinking our coffee and sheltered from the rain, we were delighted to see a Northern Wheatear and a Whimbrel just outside on the edge of the Fleet. 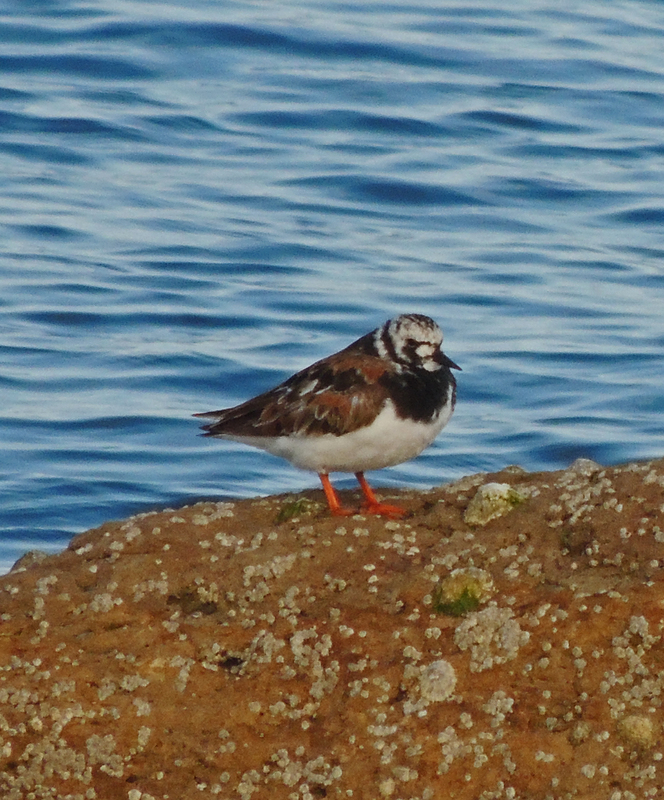 Later, once the rain had stopped we found a flock of Ringed Plover and Dunlin, together with a single Sanderling. 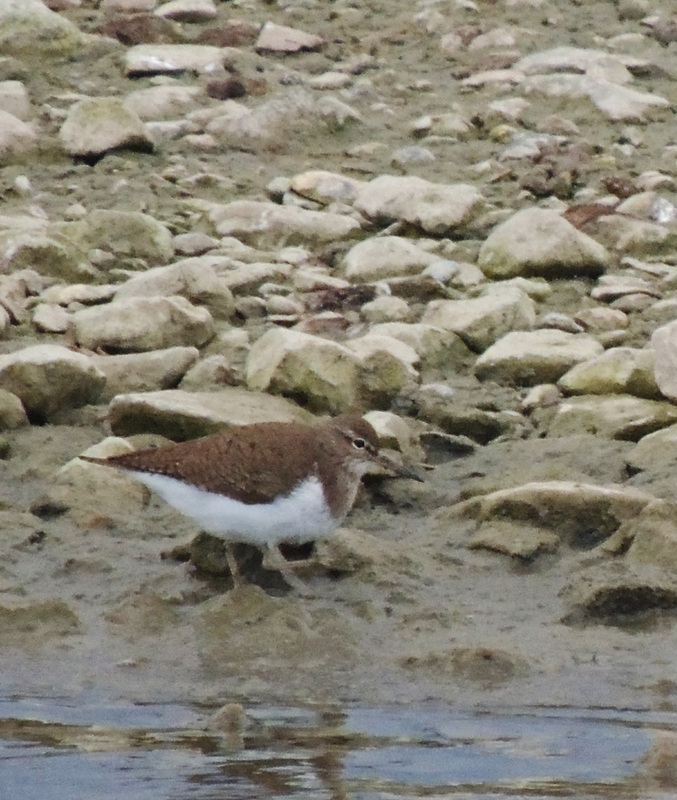 Returning to Weymouth, we made a brief stop at the reserve centre at Radipole, where a single Common sandpiper on the island was the only bird of note. 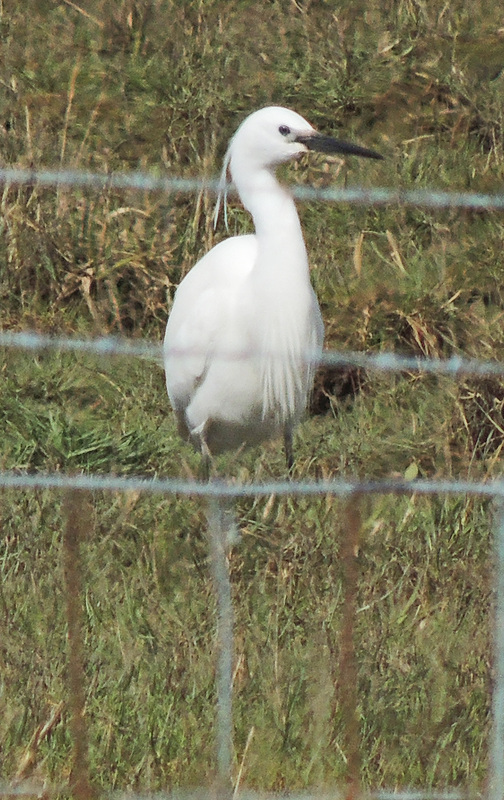 A few days birdwatching with Keith in Dorset. 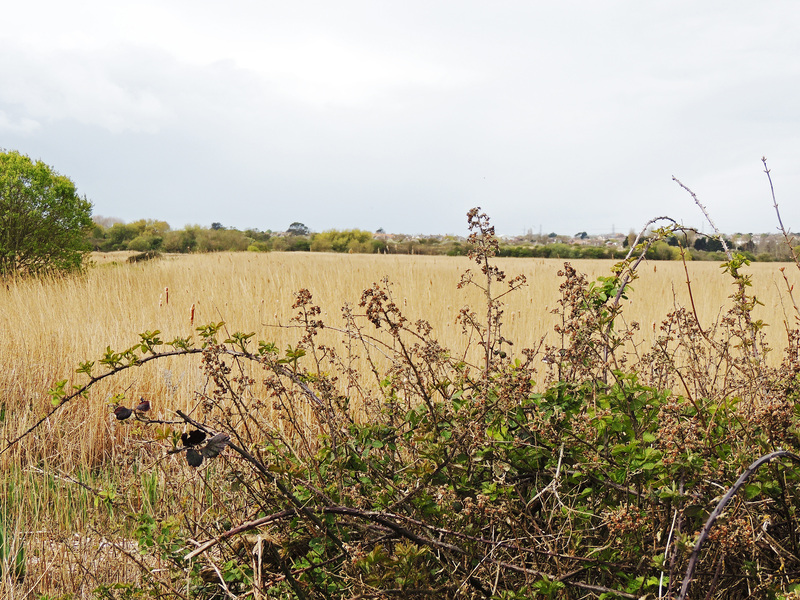 On our arrival in Weymouth we dropped our luggage off at the accommodation and headed out to the RSPB at Radipole Lake, a nature reserve won the lower reaches of the River Wey as it enters the town. 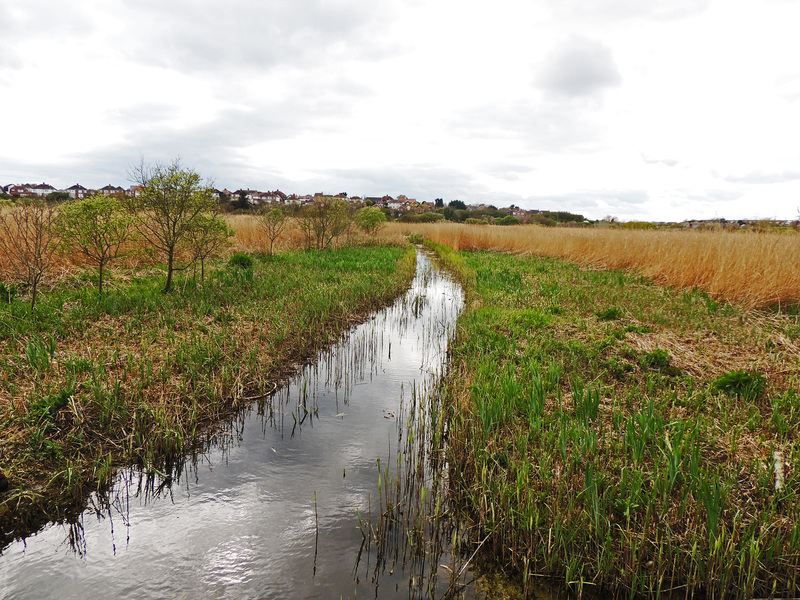 Walking along the entrance path we are greeted by a chorus of Reed Warbler, Sedge Warbler and Cetti’s Warbler all in song, although they all contrive to stay out of sight in the reed-beds. 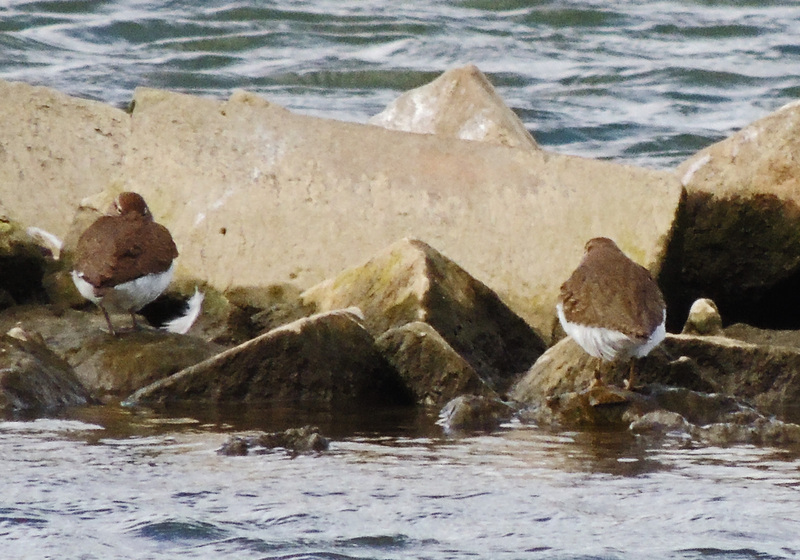 A distant Marsh Harrier was seen and 3 Common Sandpipers were located on an island in the river. 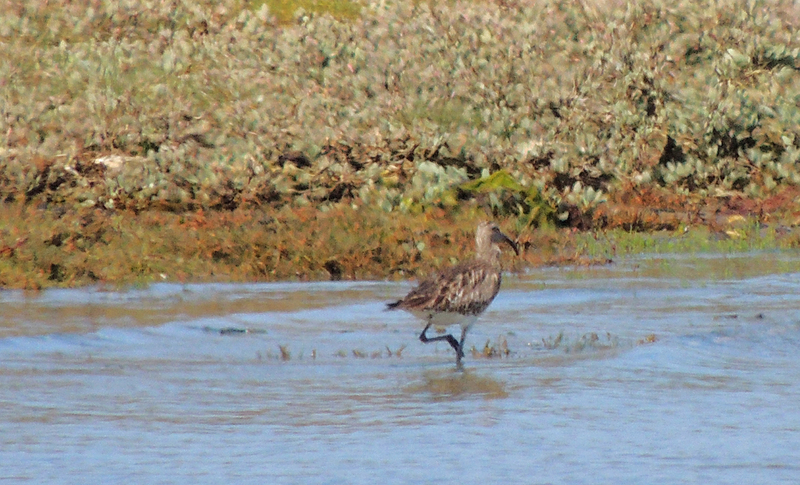 Returning back to the reserve centre a Greenshank and 2 Black-tailed Godwits were feeding on the mud exposed by the receding tide. 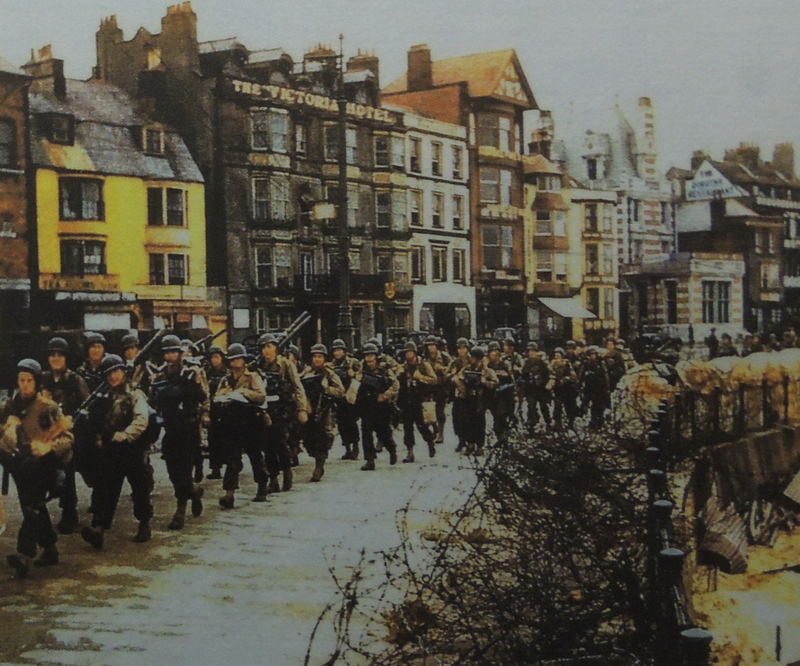 The final stage in the history of Northe Fort was during the second world war. 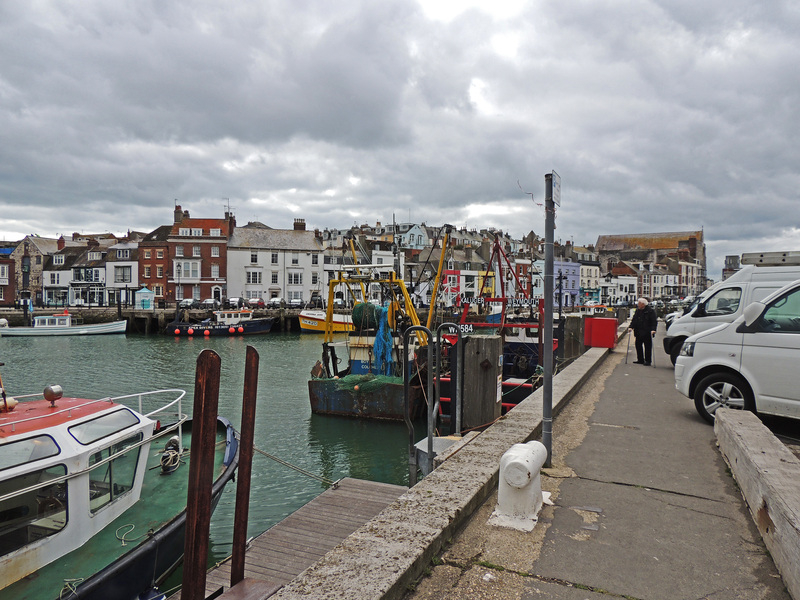 Both Portland and Weymouth harbours were important strategic sites. 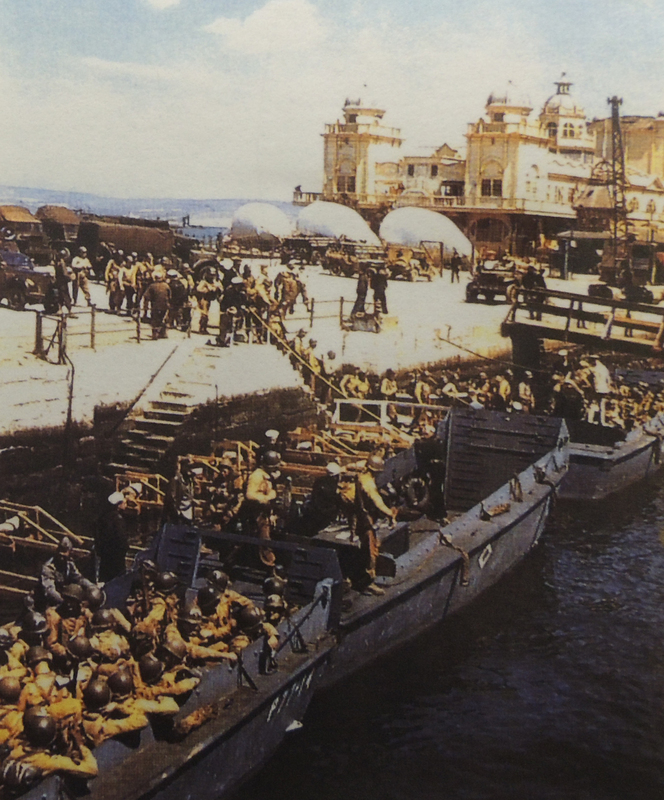 Weymouth for the transport of troops to Europe, most notably the American troops to Omaha beach on D-day and Portland as a major naval base. 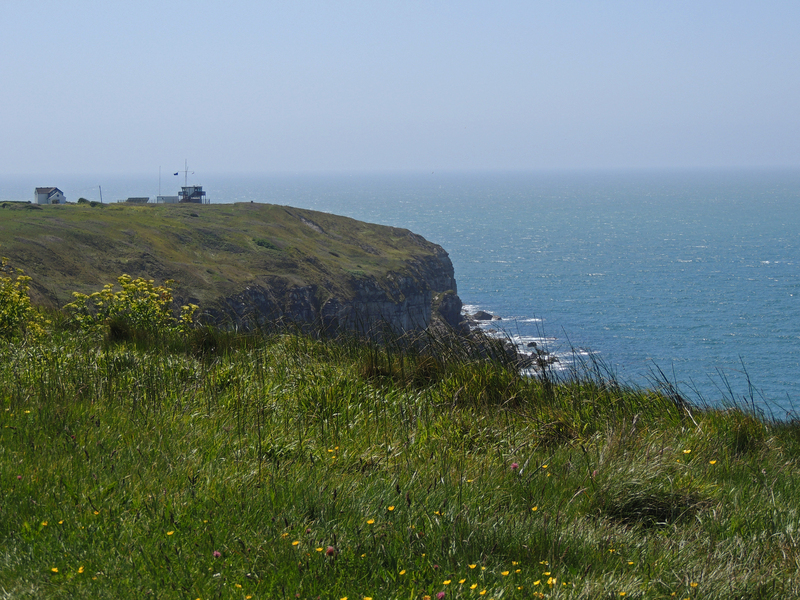 In addition an anti-aircraft battery was added both to the Fort and elsewhere on the point to protect the harbours and town, where there was a factory of a major manufacturer of torpedos.